A Mexican Crossing Lines – Interview with Michael Wood Jr.
A Mexican Crossing Lines, February 7, 2017 -Interview with Michael Wood Jr. Hear about Michael Wood’s experience with The Veterans Stand For Standing Rock and what happened in early December with the Veteran”s operation to protect Water Protectors at Standing Rock. Omg…I listened start to finish in one sitting. So much to digest…Hope you fine a video with Mary in the shot. Michael Wood said that no vets should have been in the camps, but when I got to Oceti Sakowin on December 3rd, a huge military tent was set up and manned with volunteers for the sole purpose of signing in arriving vets! He also said that there was no leadership at the camp, but anyone who spent any time at the Sacred Fire knew that there was a definite leadership. I think that Michael Wood was not willing to recognize or submit to the existing leadership. 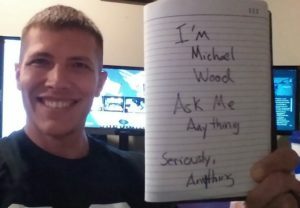 Michael Wood appears to be a pathological liar and thief!